I spent some time in the mall this week. I am finished with my shopping, but I love the energy of a mall during the Christmas season. In one of Atlanta's more upscale malls, Phipps Plaza, I looked in the window of the new Tory Burch store. The design of the store is really beautiful; it is a little jewelbox of orange and gold, with mirrored walls and a fireplace in the middle of the store. Although there were many amazing things for sale, my eye was caught by the stunning chandeliers. There are two chandeliers, in fact, one in the front of the store, and one in the back on the other side of the fireplace. You can see the bottom of the front chandelier in this picture; on the other side of the mirrored column is a fireplace, and you can see some of the shades of the back chandelier on the far left. 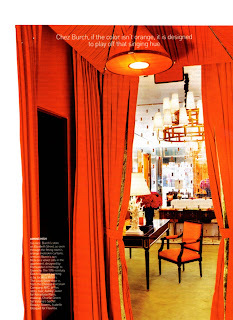 The shades are trimmed in the same orange the dominates the decor of the store, and it is so effective. It looks like the Dallas store has the same chandelier. Greenwich apparently has it too...I see the shades on the far left of this picture. I e-mailed the company to see who makes this chandelier, but have not heard back yet. After all, in the busiest selling season of the year, responding to a question about the chandeliers in their stores is not really high priority! However, as soon as I saw the chandeliers, I suspected that they are the magnificent Nancy Corzine Balthazar chandelier. A friend of mine showed me a picture of this chandelier recently (thinking I would like it, and she was right), so it was gratifying to (possibly) recognize it in person. Hopefully I will hear back from the Tory Burch web site at some point, and get confirmation whether my suspicions are correct. The Balthazar chandelier is very expensive, but it is so unique and beautifully crafted. Edit: I found this picture of the Tory Burch NYC store on the Peak of Chic blog. It gives a better view of the chandelier. After seeing the detail in the picture, I am not so sure that this is the same chandelier. The arms of the Burch chandelier are longer and project more. I will have to figure this out! Edit #2: Mystery solved, but not entirely to my satisfaction! I am not sure if they are available to individuals. The manufacturer of these chandeliers is Garrison Rousseau, a company in the Philipines that crafts custom furniture and does special commissions for companies and individuals such as Armani, Nina Campbell, Holly Hunt, the Four Seasons, Vincente Wolf, and so on, and so on! Click on this picture to enlarge. You can get a good detailed view of 'the chandelier'. Its hard to tell - your pictures dont get big when you click on them - I wonder why? anyway - it looks like it might be the same - the biggest difference I can see is that brass around the bottom of each shade - but that might be caused by the lightbulb being on. Let us know - are you going to buy it? I took these pictures off the Tory Burch website, which is probably why they don't get big. I love this chandelier, but as I recall, the 'trade' price on the single Balthazar sconce is $900 or so, so I would imagine that this chandelier is quite pricy! I will definitely keep it in my file for the next house, though. Maybe in the library. My husband lives in fear of the next house, since I have quite a few items that I am holding off on purchasing until our next move! I tried to enlarge the photos too - they are beautiful fixtures! "Jewel box" is indeed the best way to describe the first picture. Just lovely! Merry Christmas!! You are such the sleuth! I love how you can always track these things down! The chandelier is beautiful, as are the store photos. As an aside, I adore Nina Campbell...in fact, one of my very favorite dining rooms ever was her amethyst dining room in the basement of her London(Chelsea, I think) townhome. I think she has since sold that home and moved on, but it was gorgeous.